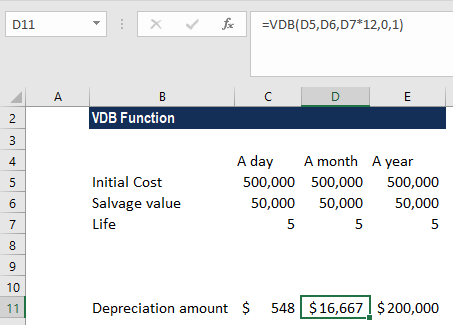 What is the VDB Declining Balance Function? 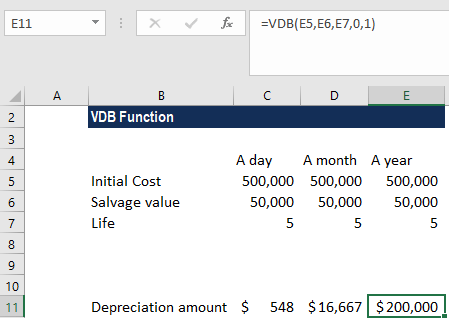 The VDB Function is a Financial functionFunctionsList of the most important Excel functions for financial analysts. 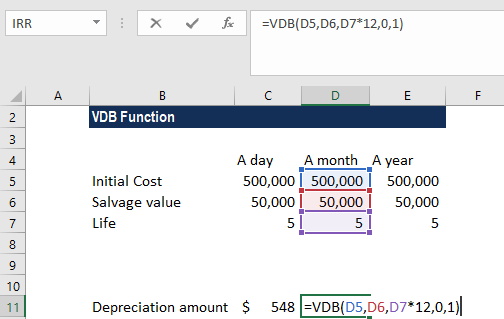 This cheat sheet covers 100s of functions that are critical to know as an Excel analyst that calculates the depreciation of an asset using the Double Declining Balance (DDB) methodDepreciation MethodsThe most common types of depreciation methods include straight-line, double declining balance, units of production, and sum of years digits. There are various formulas for calculating depreciation of an asset or some other method specified by the user. VDB is a short form of Variable Declining Balance. 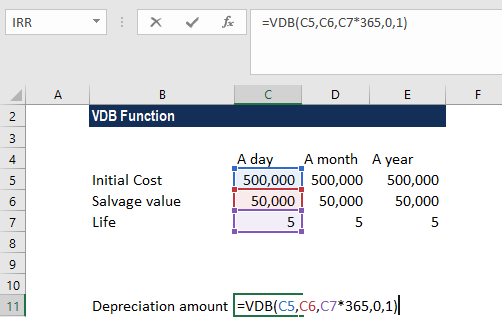 The Excel VDB function also allows us to specify a factor to multiply the Straight-Line DepreciationStraight Line DepreciationStraight line depreciation is the most commonly used and easiest method for allocating depreciation of an asset. With the straight line method, the annual depreciation expense equals the cost of the asset minus the salvage value, divided by the useful life (# of years). This guide has examples, formulas, explanations by, although the function uses the DDB method by default. It will help a financial analyst in building financial modelsTypes of Financial ModelsThe most common types of financial models include: 3 statement model, DCF model, M&A model, LBO model, budget model. Discover the top 10 types of Excel models in this detailed guide, including images and examples of each. Financial modeling is performed for many reasons including to value a business, raise money or creating a fixed asset depreciation scheduleDepreciation ScheduleA depreciation schedule is required in financial modeling to forecast the value of a company's fixed assets (balance sheet), depreciation expense (income statement) and capital expenditures (cash flow statement). In financial modeling, a depreciation schedule is requried to link the three financial statements in Excel for analysis. Salvage (required argument) – It is the value of an asset at the end of the depreciation. It can be zero. It is also known as the salvage value. Start_period (required argument) – It is the starting period for which you want to calculate the depreciation. Start_period must use the same units as life. End_period (required argument) – It is the ending period for which you want to calculate the depreciation. End_period must use the same units as life. Factor (optional argument) – It is the rate of depreciation. If we omit the argument, the function will take the default value of 2, which denotes the double declining method. 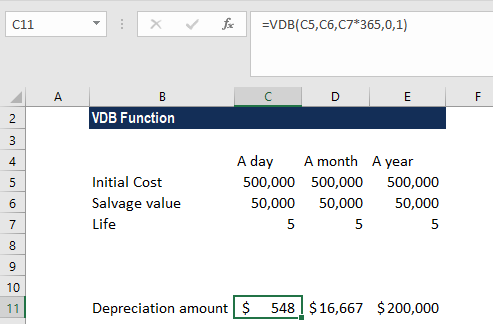 FALSE – Excel will switch to the straight-line depreciation method when depreciation is greater than the declining balance calculation. Assuming we wish to calculate the depreciation for an asset with an initial cost of $500,000 and a salvage value of $50,000 after 5 years. 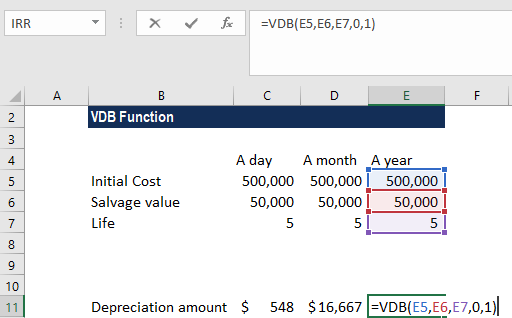 In the formulas above, we did not provide the factor argument so Excel assumed it as 2 and used the DDB method. Excel also assumed the no_switch argument as FALSE. We need to provide arguments “period” and “life” in the same units of time: years, months or days. All arguments except no_switch must be positive numbers. Start_period > life or end_period > life.